Leaders of the Midtown center, already home to one of America’s largest puppet collections, hope to elicit reactions like Erickson’s from a more global visitor base. A 16,000-square-foot expansion is forging ahead this summer, with hopes of wrapping during the 2015 summer tourist season. 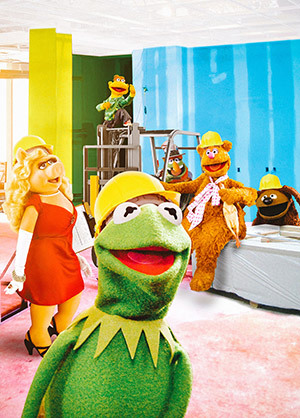 Coincidentally, next year also marks the sixtieth birthday of Miss Piggy’s little green beau. The $14 million–plus expansion, funded by private and corporate donations, will bring the center’s hodgepodge of museum, theater, and workshops to the lip of Spring Street, juxtaposing a sweeping modern structure with the center’s current home, the former Spring Street Elementary School. Visitors will pass under a new electronic marquee to find a vast array of international puppetry artifacts—including rarely displayed Mesoamerican pieces that predate Columbus’s westward voyage—and a rotating exhibit pulled from more than 400 objects built by Henson and his colleagues, courtesy of a bulk donation that was initiated in 2007. Expect an interactive exhibit inspired by Henson’s workshop and iconic, one-of-a-kind puppets such as Big Bird, Elmo, and those strangely perky Fraggle Rock creatures. Together it will be the largest Henson collection in the world. “If you’re a Henson nut, you’ll see a lot of the stuff you like,” says Vince Anthony, center founder and executive director.